MB Atlantis Astrology Software is just the tool that you are sure to look for if you want to get an astrology reading according to the Atlantis astrology principles. If you get a free Atlantis analysis or Atlantis astrology reading from this wonderful tool, you will come to know your Atlantis sign or Atlantis astrology sign. 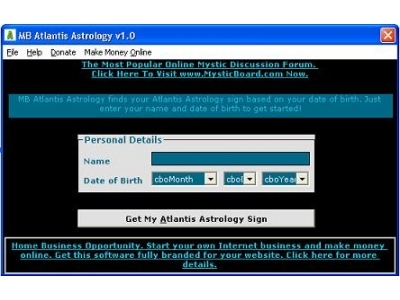 MB Atlantis Astrology Software will also provide you with the attributes of your Atlantis sign. The uniqueness of Atlantis astrology is that its astrological calculations take into account 15 Atlantis signs or Atlantis astrology signs unlike the other astrology systems most of which have 12 zodiac signs.